The first public high school in the city, this building was altered significantly to become Durham's City Hall in the 1920s, and then again to become a home for the Durham Arts Council in the 1980s. The DAC has some interesting space, but about the only time I see it is during the documentary film festival. Ellen gave your website a nice plug in the HPSD newsletter, BTW. Thank you. I have a similar postcard of the old high school and never knew where it was. I'd assumed that it was torn down long ago, along with all the other buildings you've described on this site. I never realized that is still standing. I knew the Arts Center used to be City Hall, but didn't know that it was a high school before that. dcr - They have some good exhibits and offer some really cool classes that I wish I had time to take as well. I've heard about the newsletter, but I've not seen it - glad to hear that it was a nice plug. Daniel - glad you appreciated it. Maybe we can consider it Durham's first adaptive resuse project. Among other organizations that use the "adaptively re-used" DAC, the Durham Children's Choir -- http://durhamchildrenschoir.org/ -- rehearses there =weekly during the school year. I recommend going to one of their performances if you have the chance. 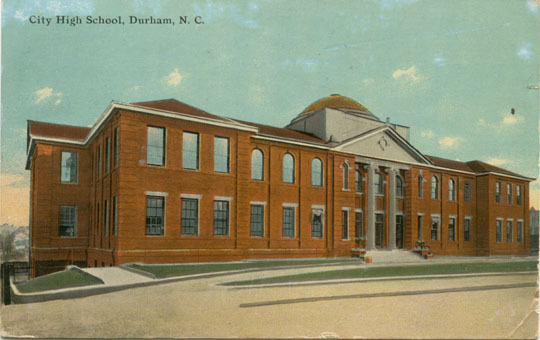 Linthicum & Linthicum, who were known for school design, claimed the Durham High School in a 1905 Manufacturers Record. I haven't seen it attributed to any other firm (except a 1920s Milburn & Heister remodel), and it fits with their other institutional work. 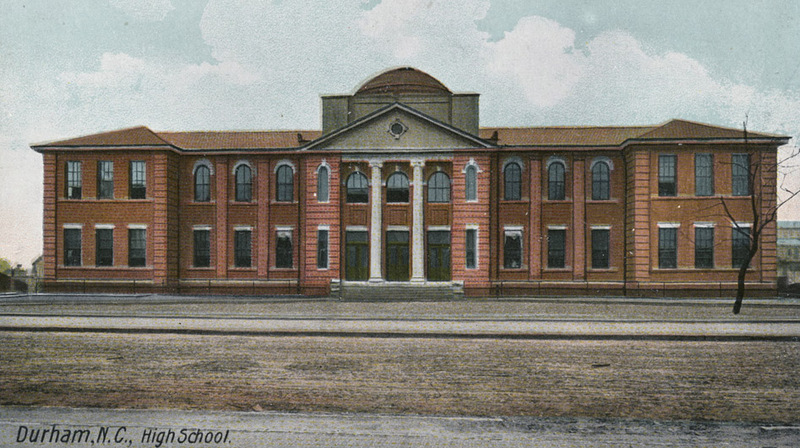 The first city high school was built in 1906 on the site of the JL Watkins tobacco prizery, for which no picture is available. The Durham Graded School on Dandy St. (later Jackson St.) no longer could accommodate all grade levels and became the Morehead School, an elementary school, after the construction of the new city high school. Although I don't have documentation that this school was all-white, I am presuming that it was, as I know the schools were segregated after 1922. From a postcard, after construction. The school operated at this location until 1922, when a larger high school was built on the former homeplace of Brodie Duke, between Duke, Morgan, and Gregson Streets. 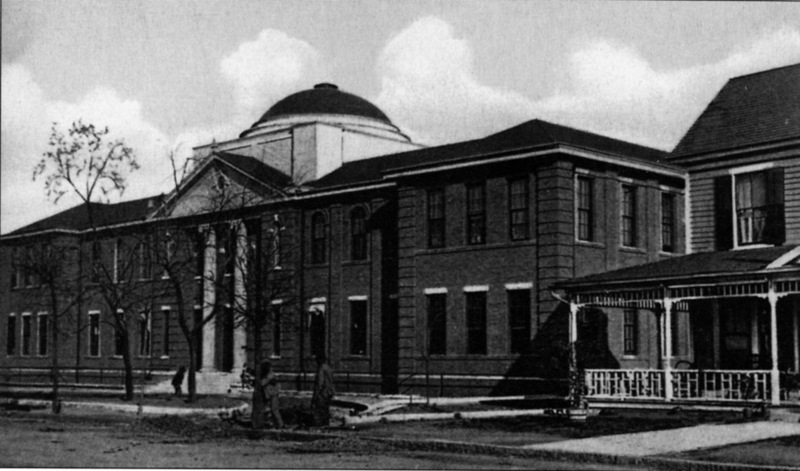 (And, at the same time, the original Hillside High School was built on Umstead St.) With the demolition of the New Academy of Music for the Washington Duke Hotel, a new city hall was necessary, as was a new theater. 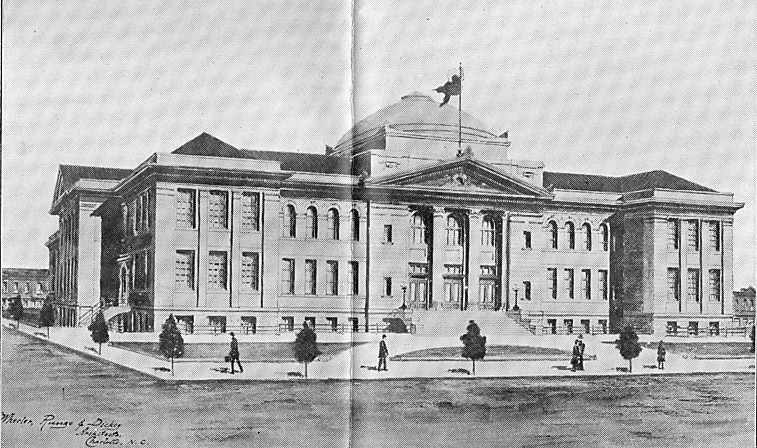 Concomitant with the construction of the Durham Auditorium (now the Carolina theater) in 1926, which was grafted onto this building, the old city high school was remodeled to match the Auditorium architecture (a neoclassical design that removed the dome and original pedimented facade), and became the new city hall. As part of the 1950's-era Tarrant plan for 'revitalizing downtown' (yes, this has been going on a really long time), a new civic complex was to be built at Mangum and Chapel Hill Sts. It would be surrounded by plazas as part of a road configuration that would come to be known as 'the Loop'. The area just inside the Loop would be demolished for parking (and Main St. turned into a pedestrian mall.) Included in the soon-to-be parking lots were the old City Hall and the Durham Auditorium. For once, cooler heads prevailed on a proposed demolition in Durham. The awful edifice now known as city hall was built, and the city government moved out of the building on Morris St.
Old City Hall, 1978, after the city government had decamped to parts east. A multitude of visual and performing arts groups had come into being during the post-war era, each individually supporting their own particular medium. The president of the Theatre Guild called a meeting with the principals of the other groups (including The Art Guild, Civic Choral Society, Duke University Arts Council, Chamber Arts Society, and the Durham chapter of the North Carolina Symphony Society) to discuss forming an umbrella organization to provide mutual support in 1953. Their assent was the genesis of United Arts, which became Allied Arts of Durham in 1954. 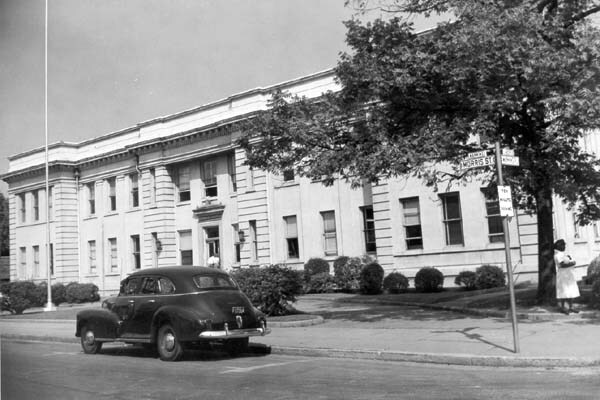 They moved into Harwood Hall on South Duke St. in October, 1954. After Harwood Hall was demolished in 1961, the group moved to the Foushee House, where they were headquartered until the old City Hall became available. Along with the construction of the People's Security insurance building in 1986-87, the old city hall building was remodeled with a new, pedimented addition on the front, and some additional glass sheathing on the side. The completed "Royall Center for the Arts", 1989. The arts council is a persistent bright spot downtown. From a land use perspective, I think they suffer a bit from a lot of dead space around them - the loop/parking deck to the north, SouthBank to the West, and some surface parking to the south. Even the Carolina Theater, to which it is attached, is oddly separated from it by the service equipment/Loop trek to the north and east, and the blank wall at the end of Manning Place. I think this building and the Carolina Theater convey the consistent message: good things happen when you decide not to demolish buildings downtown.